Bowral /ˈbaʊrəl/ is the largest town in the Southern Highlands of New South Wales, Australia, and the main business and entertainment precinct of the Wingecarribee Shire and Highlands. As of 2011[update] the population numbered 12,154. In a past era, Bowral served as a rural summer retreat for the elite gentry of Sydney, resulting in the establishment of many grand historic estates and manor houses in the district. Today, Bowral is often associated with the cricketer Sir Donald Bradman. Bowral is close to several other historic towns, being 5 kilometres (3 mi) from Mittagong, 9 kilometres (6 mi) from both Moss Vale and Berrima. The suburb of East Bowral and the village of Burradoo are nearby. Bowral's history extends back for approximately 200 years. During the pre-colonial era, the land was home to an Aboriginal tribe known as Tharawal. This was not a permanent setting for the Indigenous people, as the climate of the region was considered too cool. The name Bowral is believed to be derived from the Aboriginal word "Bowrel" which loosely translates into the word "high". Ex-convict John Wilson, whose search party was commissioned by Governor Hunter to explore south of the new colony of Sydney. Other people to traverse the area include John Warby and botanist George Caley (an associate of Joseph Banks), the Hume brothers and later famous pioneer explorers John Oxley and Charles Throsby. Governor Lachlan Macquarie of the New South Wales colony had appointed 2,400 acres (9.7 km2) to John Oxley in a land grant, which was later incorporated as Bowral. The town grew rapidly between the 1860s and the 1890s, mainly due to the building of the railway line from Sydney to Melbourne. In 1863, a permanent stone building was built for the church. However, the building would be replaced by the first Anglican church of St Simon and St Jude. The church and chapel had been designed by Edmund Blacket and was built on the glebe in 1874. The churches would once again be subject to rebuilding in 1887 because the churches had been deemed too small for the growing town. Today, only Blackett's belltower remains on the current Church of St. Simon and St. Jude. Gardens and European plants flourished from 1887, when citizens of Bowral started planting European and English deciduous trees to make the area look more British. This legacy still lives on throughout Bowral. Notably, the oaks at the start of Bong Bong St are a characteristic that makes Bowral distinct from other rural towns, giving it strong autumn colour. The town became somewhat affluent, as many wealthy Sydney-siders purchased property or land in the town and built grand Victorian weatherboard homes, giving it a distinctly New England (USA) feel. Bowral and the former spelling Bowrall. may have been derived from an Aboriginal word meaning "high and large". At the 2011 census, Bowral had a population of 12,154. In the 21st century, Bowral has become a haven for retirees and empty nesters, commonly from Sydney: 15% of Bowral's population is aged 55–64 years (compared with the national average of 11.6%) and 29% is aged over 64 years (compared with the national average of 14%). Consequently, the town has a number of retirement villages, some located only minutes' walk from the central business district and hospitals. Also, as measured during the 2011 census, 42.4% of the town's population are under the age of 45, whereas for the nation the figure is 60.7%. Bowral is about 5 kilometres (3 mi) from the Hume Highway, which goes north to Sydney and south to Canberra, the Snowy Mountains and Melbourne. In the past, Bowral served as an overnight stop-over for travellers. 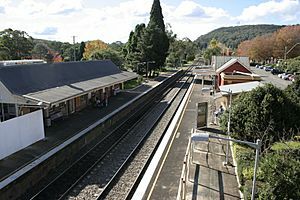 Bowral railway station is served by the Southern Highlands Line with services between Sydney and Moss Vale or Goulburn. Long distance services operate to Canberra and Melbourne. It has public bus routes to Nowra, Albion Park and Wollongong. A private operator provides a service six days a week from Bowral to Greater Sydney (Campbelltown, Liverpool and Parramatta) and to the Shoalhaven and south coast of New South Wales. Bowral has an oceanic climate (Cfb), enjoying warm summers and quite cool to cold winters. Frost is common during winter although temperatures rarely fall below −5 degrees Celsius. Snow falls occasionally, although falls in excess of 15 cm have been recorded. Historic maxima and minima have ranged from 40.0 °C (104.0 °F) on 30 January 2003 to −11.2 °C (11.8 °F) on 11 July 1971. Bowral is the best known of the towns and villages of the Southern Highlands and is noted for its boutiques, antique stores, gourmet restaurants and cafés. 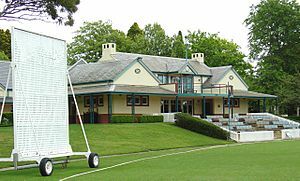 The Bradman Oval, Bradman Museum and International Cricket Hall of Fame are dedicated to the achievements of cricketer Sir Donald Bradman and to the game of cricket. Bowral is the setting for Tulip Time at the famed Corbett Gardens, a springtime celebration with a profusion of tulips and other flowers planted in the town centre. Held each year in September and October, Tulip Time has become one of Australia's leading floral festivals, alongside which gardening enthusiasts may view some of the nation's most beautiful formal gardens. A comprehensive private not-for-profit botanic garden is being established to include a mix of exotic, native, and endemic species including a shale woodland, the endangered ecological community endemic to the site. The town has a Vietnam War Memorial and Cherry Tree Walk, constructed along the Mittagong Rivulet that flows through the town. Along a walking/cycle track beside the stream are planted 526 cherry trees, each dedicated to a soldier who died in the service of his country. Bowral and surrounding region was proclaimed a Booktown in 2000 having numerous bookshops and associations with many literary figures including P. L. Travers, the author of the Mary Poppins novels, Arthur Upfield, and many others. Panoramic view of Bowral from the Bowral Lookout on Mount Gibraltar. Moss Vale and the ranges near Bundanoon can be seen in the background. The Bong Bong Picnic Races, commenced in 1886, attracted crowds of up to 35,000 but were suspended in 1985 and resumed in 1992 as a members-only event. The event still attracts around 5,000 people and is held annually in November, as well as other events during the year. Bowral is also home to a few vineyards and cellar doors and is close to Mittagong, the winery centre of the Southern Highlands. There are 60 vineyards in the Southern Highlands, which is a recognised cool-climate wine district. Wineries around Bowral are listed in the Southern Highlands Wineries Index. Bowral is overshadowed by Mount Gibraltar, which rises to 863 metres (2,831 ft) above sea level and has lookouts over Bowral, Mittagong, Moss Vale and the ranges near Bundanoon. Bowral Facts for Kids. Kiddle Encyclopedia.